Milford is located on the Delaware River in the northwestern portion of the County. The Borough dates to the mid-18th century when a grist mill was established here. After the mill was destroyed by fire in 1769, the settlement became known as Burnt Mills. The town became commonly known as "Millford" by the beginning of the 19th century but by 1844 had lost one an "l". It was incorporated in 1911 but the official incorporation was not registered until 1925. A special town in its present day, Milford maintains its sense of reality and hometown charm. Many local businesses are family owned and operated. The whole community invites visitors and neighbors to share their pride in "Milford on the Delaware", its heritage and its culture. 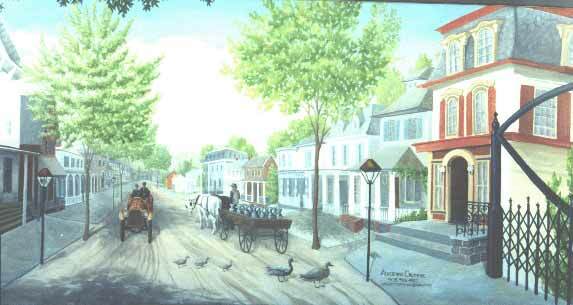 The Milford Mural is Adrienne Crombie's rendition of how the charming river town of Milford, New Jersey may have looked in 1911, the year it was established. The artwork was created as a model for her mural painted on the Water Street side of the Post Office building.